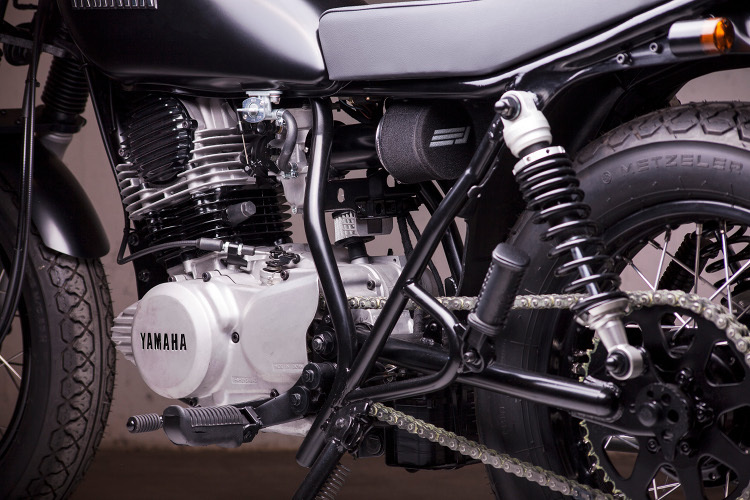 Jake Snowdon is a mechanical engineer living in Malmö, Sweden, who started his company, Jadus Motorcycle Parts, designing and producing a range of high-quality custom parts for specific models like the Yamaha SR250. 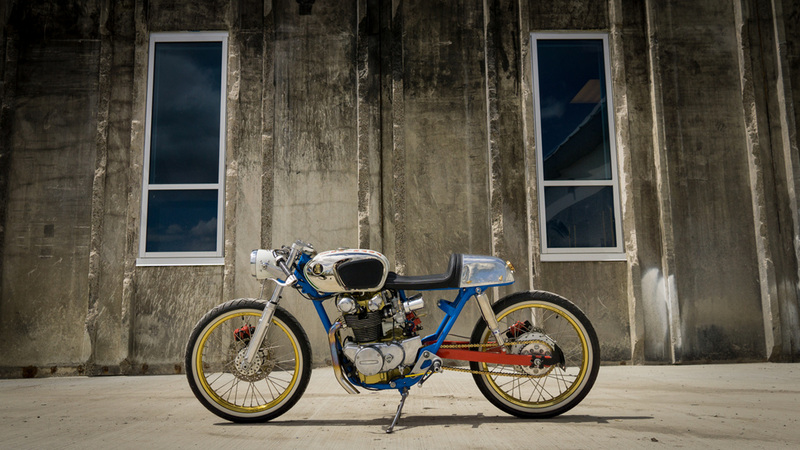 Jake loves the SR so much he actually wrote a feature on the subject for us: 5 Best Yamaha SR250 Customs. We can’t even begin to tell the story of his build as well as Jake himself, so without further ado, we’ll let him take the storytelling reins. My story goes like this: I am working as a mechanical engineer in Malmö, Sweden and moved here just over 4 years ago for a Swedish bird – way too typical story – we are no more – life goes on – I have a life here now etc. I had already been building bikes for a few years in Australia before moving here, even if it was a hobby thing and the standard was pretty low, it was the beginnings of a passion-obsession. 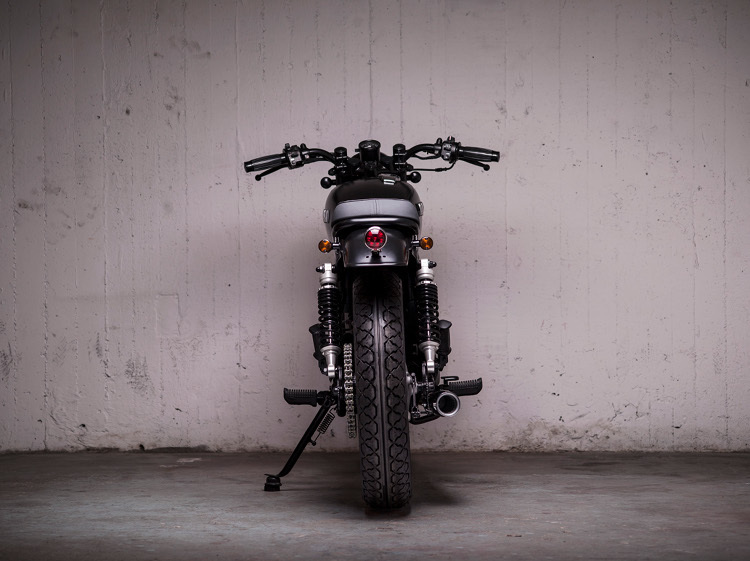 So naturally, when I moved here I set up a bit of a workshop and got on with customising bikes again – after a very short spell working for both Wrenchmonkees and Customs from Jamesville in Copenhagen (just a quick train ride over the bridge from Malmö). Basically the dream of building custom bikes didn’t quite work out and I had to get a real day job again! After a couple years of working for a small firm as a product development engineer I decided I wanted to do something a bit bigger with my passion than just building bikes in my spare time. 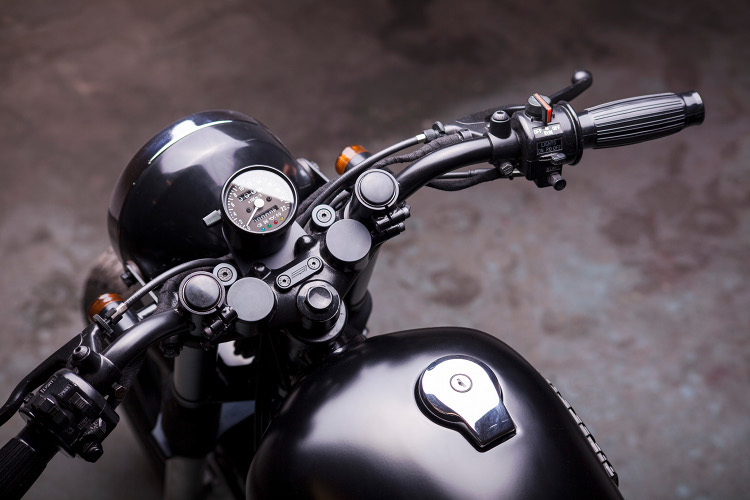 So I started a company with the intention of designing and producing custom parts for specific motorcycle models – steering away from ‘universal’ parts. 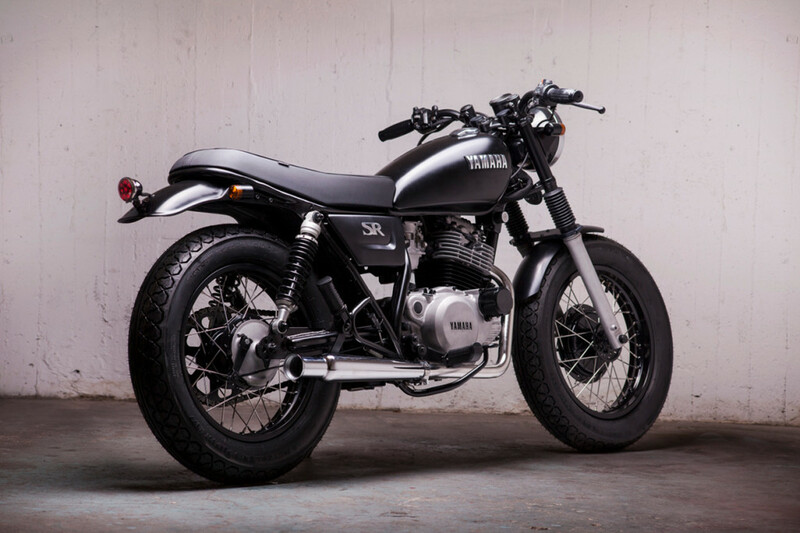 I decided to start with the humble SR250 because it was the first bike I owned and customised and after riding and wrenching on several other bikes, I realised what a treat it is. I have a special connection to SR’s now – I love ‘em. No fad items: Firestones for example, as with exhaust wrap, front end swaps, mini-headlights, stupid thin ‘brat’ seats, knobbly tyres on a street bike etc were not an option. Not that I don’t like some of those things, but that I feel like these things come and go and the bike scene has already seen enough of it. Timelessness would be the goal. 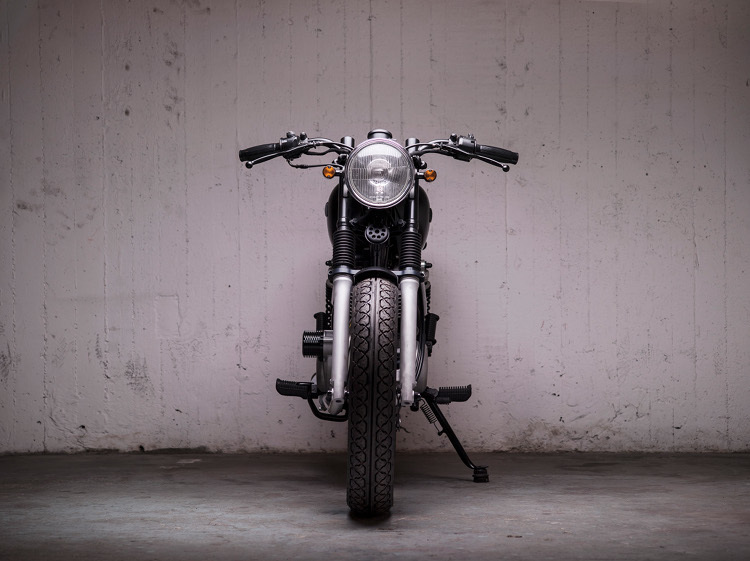 I wanted to challenge myself to build something that was highly functional and legal — steering away from the typical ‘look cool quick’ custom tricks of getting rid of the blinkers, guards, or mirrors and staying away from the ‘clean triangle’ look. Again, not that I don’t like that stuff, not at all, rather, I thought it more challenging to ‘design’ a bike that looked a little more complete and closer to factory made. 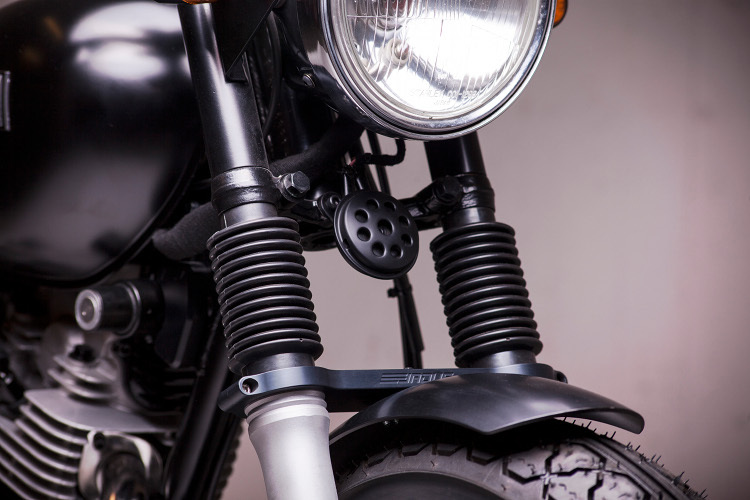 The bike should not have compromises in handling — suspension and tyre choice should be considered and frame chopping kept to a minimum. See what can be done in terms of engine performance — focusing mainly on bolt on parts that are relatively easy to install, what power increase can be had. 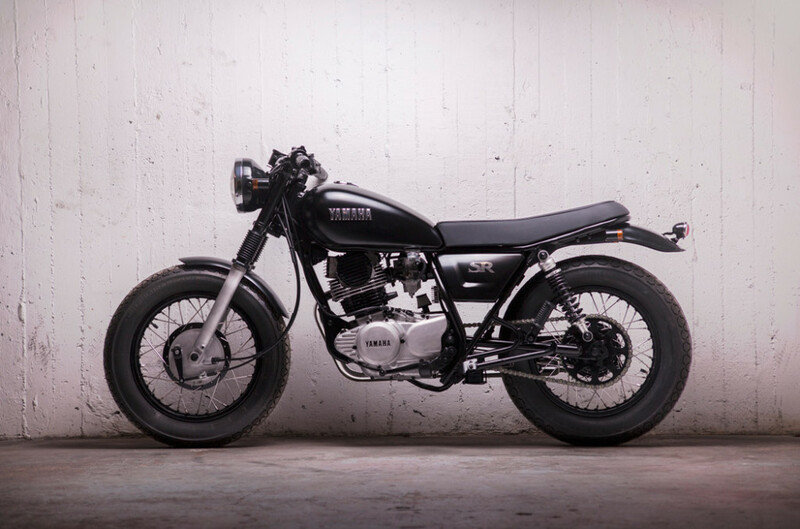 I can safely say that I could have built this bike in about 12 months if everything was custom ‘one off’ stuff. But it took two and a half years. 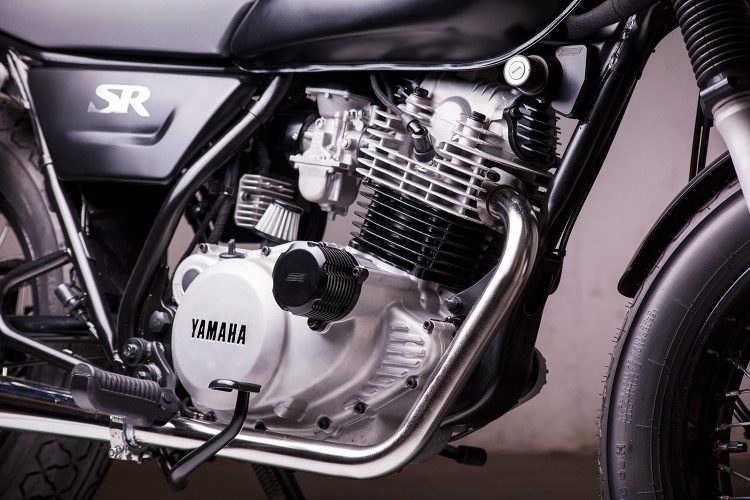 That is because every single special part on the bike has been sketched, developed, drawn up in 3D, prototyped using 3D printing (many, many times), laid out onto 2D technical drawings, production prototyped, test fitted, adjusted, tweaked and revised, then brought into production. For me this is the precise differentiation between art and design – as I remember one of my Industrial Design tutors explaining to me years ago. 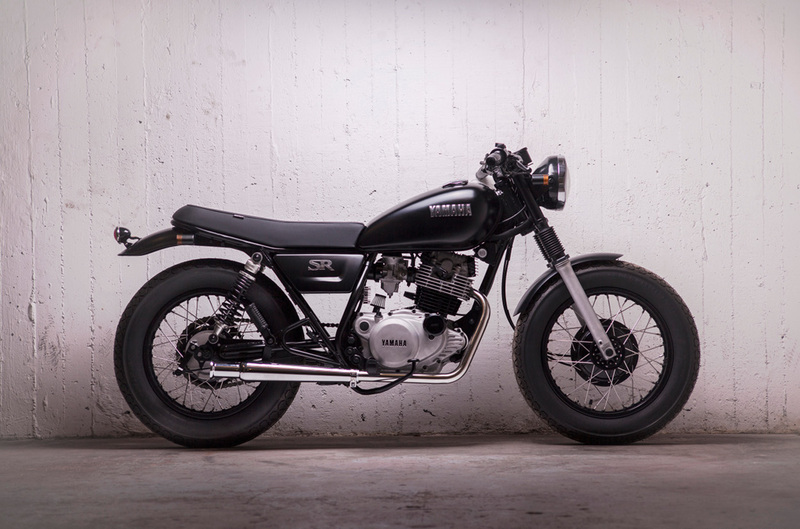 This bike is (imho) a piece of design rather than a piece of art as many customs are. It is not a ‘one off’ piece, even if it is, for now, ‘one of a kind’, rather it is a template, repeatable you could say, for future builds and inspiration to other garage builders. Most of this development process is also documented on a build thread on DTT if you are interested and have time. On to the bike… what did I end up with? 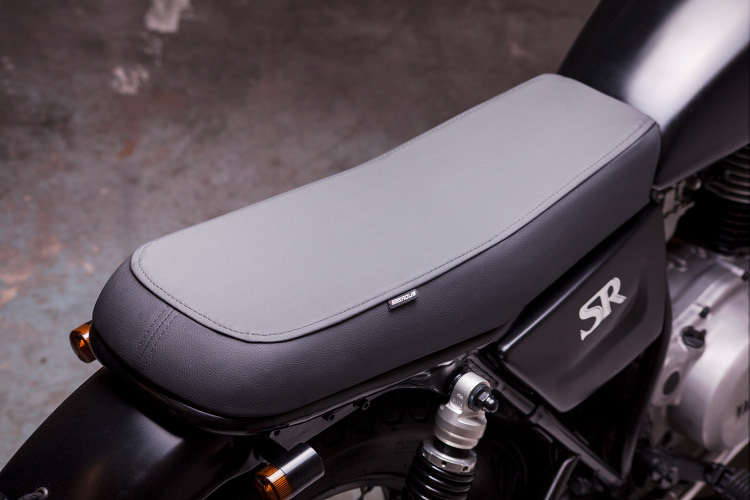 A quick side story about the side covers: They were designed and developed to be able to attach to the stock mounting positions – in case I decided to produce these and people wanted to install them on their existing battery and air boxes. So the airbox side is a little bulkier than I would have liked. Anyway, the process was long and tough, but a lot of fun. After sketching out many different concepts, I narrowed the design down to have this one dynamic panel indent feature. Then I prototyped (3D printed) the design 7 times to dial it in — tweaking the position, depth and transitions of the sweep each time, until I was satisfied — you will see it lines up with the flow of the tank. I wanted something that didn’t look too aggressive or out of place, something standard looking. I used product design modelling techniques – with consideration to curvature and surface transitions. I like the final outcome! A quick story about the development of the performance parts: After more than 20 hours of dyno time spread over two different test SR’s and two separate dyno machines and operators, the combination of ignition advance, optimised header design, special 3rd wave harmonic intake stack, plus oversized foam air filter gained a 20% increase in both torque and power. And the torque is fat! It doesn’t fall off until much later in the power curve compared to stock. I won’t state numbers, but let’s just say it now makes what Yamaha claimed and that what Yamaha claimed was about 20% off haha. The extra gains made the clutch slip like crazy, so we installed 20% stronger than stock clutch springs, plus specially made spacers to raise the clutch plate pressure even more. I prototyped the header 6 times and tested two different designs – both with the same diameter tube but with different lengths. The chosen one had the best spread of power. I also developed and tested both a 2nd wave and a 4th wave harmonic intake design, neither were even close to performing as well as the 3rd wave design. I consider these mods to be the low hanging fruits, relatively easy to install, big gains. To get more from the engine, which has a lot of potential, you would need to up the bore, get a different cam grind, ported head, lighter valves, springs retainers etc etc. I will do that someday, but this was enough for this bike. A 20% gain is really felt in the seat! One mod I did want to try and prepared for was to advance the cam timing with some shims and a modified keyhole. This will be a project for later down the road. Also, after CAD simulations and hours of real world testing with temperature sensors rigged up to the head and oil system – both at the sump and after the oil filter, the finned valve inspection covers shed around 2-3 degrees of heat over the stock ones and the oil filter cover sheds around 3-5 degrees – it has an increase in surface area of 400% over stock and ups oil capacity by 100mL. Some notes on the styling parts: I don’t like the idea of kits, even if I kind of have developed a basic platform kit now. I want the customer to feel that they have as much flexibility as possible, that they can still totally create their ‘own’ bike. I have developed parts that I myself would have liked to be available to me years ago — the hard ones to sort out yourself if you have limited tools and equipment — so most of the parts can be installed with simple hand tools. I feel like I got close to achieving my vision and design brief. I decided on a black, grey and silver colour/tone scheme because it brings out the design features best — colours can be loud and noisy distractions from purity. I also followed this scheme because it was so common for timeless bikes from the 30’s, 40’s and 50’s — Matchless, BSA, Vincent for example. 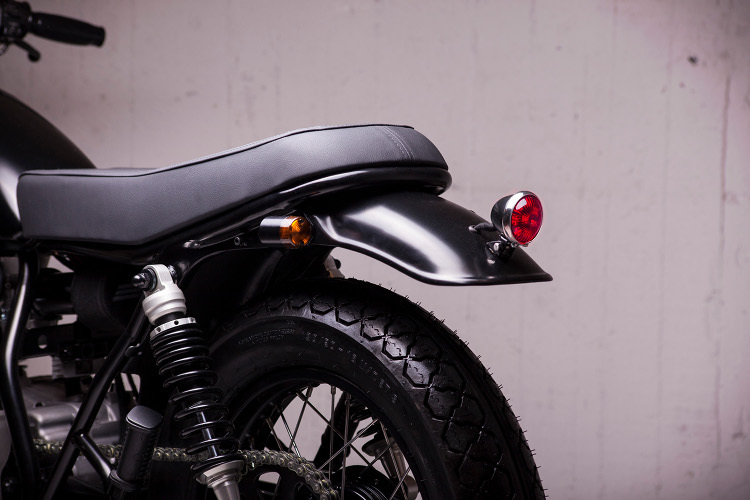 You will see the material finish and colour choice was very selective – for example, you will only see hints of chrome in very specific, chosen locations – not too much, just enough. A couple of notes about items that are not quite complete: The bike does not have mirrors. I tried 4 different styles and none suited. They all looked wrong. When it is on the road I guess I’ll just go with one of the sets, but in this case, you could say that I cheated in the photos by removing them and therefore failed this part of my brief. You might also question the handling of a fat front tyre. It handles just as good if not better than stock — the bike turns in nicely because it has a slightly more aggressive rake now with the new ride heights — all worked out in CAD before settling on angles. Rebuilding the front forks with some modern emulators is also in short order — at the moment these are the only things letting the bike down in terms of handling, they are pretty soft, squishy and non-responsive, so for the time being, I have failed on my brief here too. I don’t know what you would call this style of custom. 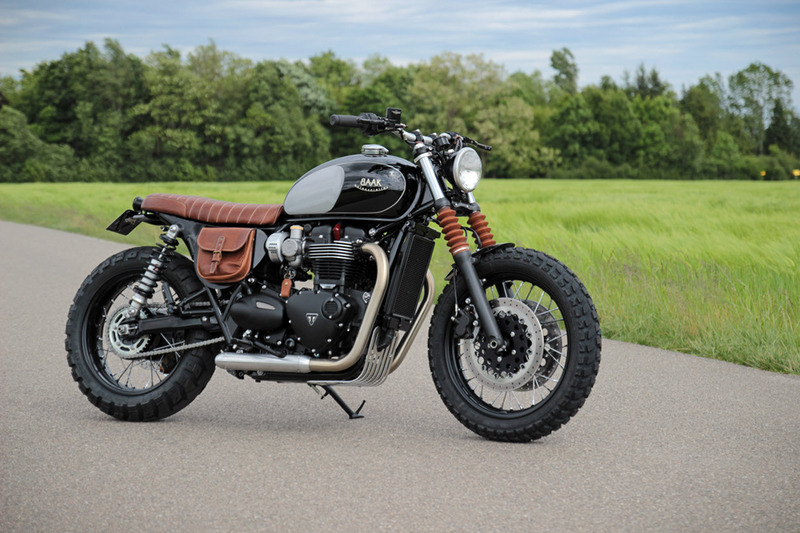 I have dubbed it a ‘clean standard’, others have called it a bobber, others a cafe-brat, others a cafe racer, some even resto-mod. Perhaps it could have been released by Yamaha in the 80’s to fit more into the UJM category? Honda CB450 Cafe Racer: "Shinobi"